Glory: Glory Hallelujah! Glory! Glory! Glory Hallelujah! Glory! Glory Hallelujah! His truth Is marching on. I have seen Him in the watch-fires of a hundred circling camps. His day is marching on.-Cho. As ye deal with my contenders, so with you my grace shall deal. Since God is marching on. - Cho. Oh, be swift, my soul, to answer Him; be Jubilant, my feet. Our God is marching on. - Cho. In the beauty of the lilies Christ was born across the sea. 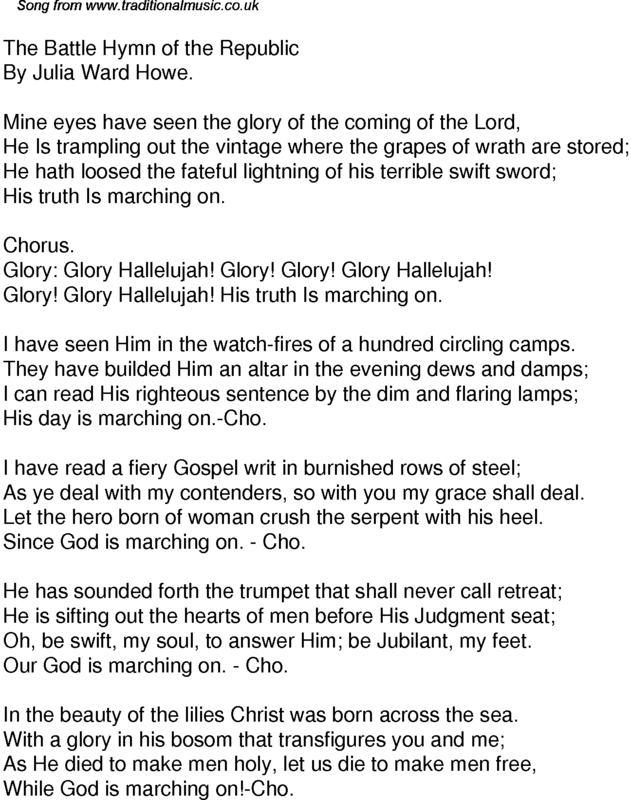 While God is marching on!-Cho.